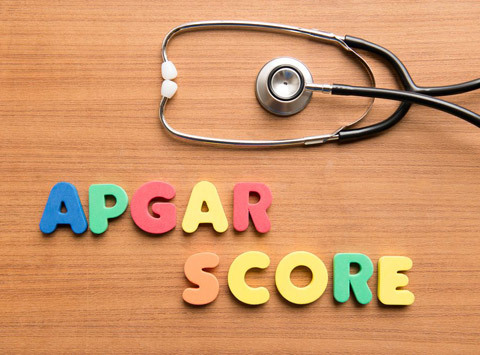 Upon arrival into this big world, the first thing in store for your new arrival is an Apgar score. Often the first time expectant parents hear the term “Apgar score” they have just delivered their new infant, and it’s not really at the top of their need-to-know priority list right then. Apgar scores are generally for the benefit of medical staff to indicate the health of the newborn; however, they can also be an interesting first fact about your child. 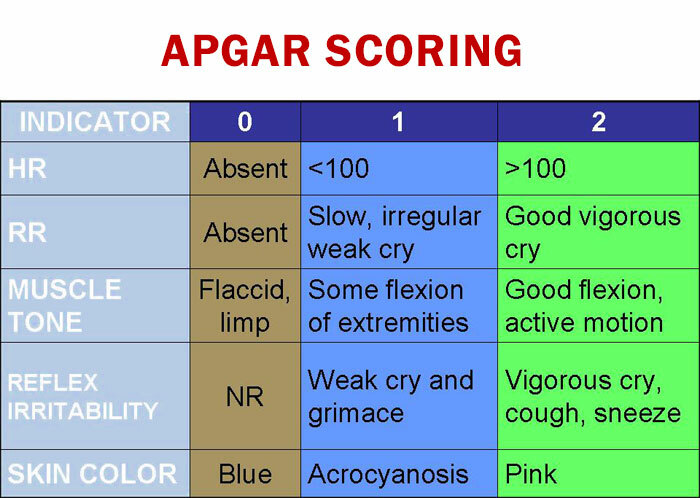 An Apgar (AP-gar) score is a quick reading of your baby’s condition at birth. Apgar scores are assigned to newborn babies in the delivery room at one and five minutes, usually by a nurse or physician. The baby is checked for skin color, heart rate, movement, breathing, and reflexes. Each is rated from 0 to 2. The Apgar score is the total of the ratings. The score at 5 minutes gives a better picture of how well your baby did during labor and delivery. Babies born before the due date or at a high altitude may have a lower score. The Apgar cannot predict how well your child will grow and develop. It all depends on your doctor or midwife as to whether the scores will be automatically shared with you. The Apgar score was originally introduced by anesthesiologist Dr. Virginia Apgar in 1952 as a way of noting the effects of anesthesia on newborns. About 10 years later, a pediatrician, Dr. Joseph Butterfield, coined the acronym APGAR to stand for the elements of the test: Appearance (skin color), Pulse, Grimace (reflex irritability), Activity (muscle tone) and Respiration. The method is quick, painless and most reassuring for new parents. Most babies are judged to be in good health, but if the test should determine that your baby does require medical attention, new parents are glad to know right away. 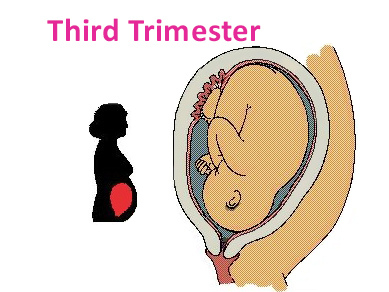 The test is administered and recorded twice: first at 1 minute after delivery and again at 5 minutes after delivery. The nurse or pediatrician checks the baby’s Appearance (coloring doctors check the soles of the feet and palms of the hands in dark skinned children), Pulse (heartbeat), Grimace (reflex response), Activity (muscle tone), and Respiration (breathing) thus giving way to the fitting acronym of APGAR. Each factor is given a score between zero and two, then scores are totaled. Most babies score between seven and ten and don’t need any immediate treatment. 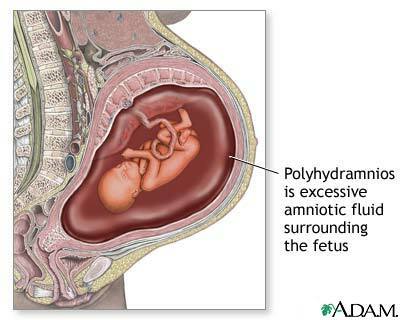 Babies scoring between 7 and 10 are considered to be in excellent condition and require only routine post-delivery care. An Apgar score between 4 and 6 means the baby is in fair condition and may require some help breathing. The nurse or pediatrician may administer oxygen under the baby’s nose or may vigorously rub the baby’s skin to aid circulation and thus respiration. A baby whose score is under 4 is considered to be in poor condition and could require more serious, immediate measures such as oxygen administered from an oxygen mask. If a score of 6 or less is calculated, then a 10-minute score is calculated, Dr. Hoffman says. “A persistent score of 6 or less may be more reason for concern and generally provokes an evaluation from the team of medical staff from the neonatal intensive care unit,” he says. The Apgar scale is used strictly to assess a baby at the time of birth. At one time, experts believed the Apgar scale could predict future health problems but recent studies have proved this to be a false notion. The Apgar score’s most valuable asset is its simplicity. 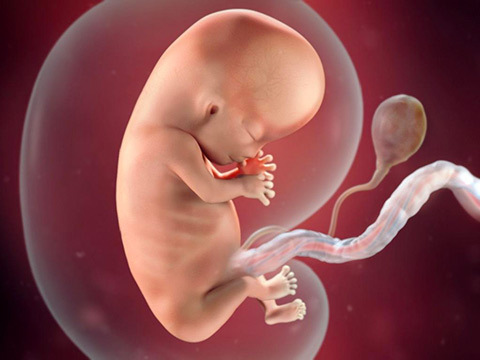 It is easily performed and measures your baby’s health quickly and with great accuracy during these first important and precious moments of life.